Earlier today, Apple released the Mavericks OS X 10.9.2 update that closes the SSL security bug that was patched last week on iOS devices. With the release of Mac OS X 10.9.2 Mavericks, Apple has taught FaceTime how to make audio only calls and call waiting for video and the aforementioned audio calls. With the 10.9.2 update, iMessages finally received a nice little update that allows you to block messages from individual senders. In addition to fixing the "goto fail" that everyone has been worried about over the last few days, Apple also included a number of fixes and enhancements across the board. Ever since the release of Mavericks, many customers have been unhappy with the bugs in the OS X Mail application, specifically when used with a Gmail account. Apple continues to make those corrections in this release with six fixes directly related to Mail. This release also brings fixes to networking features, including improved support for SMB2 shares, VPN connections, and OS X Server NetBoot services. Lastly, there was a website compatibility update for the AutoFill feature of Safari. You can read the full release notes for Mac OS X 10.9.2 Mavericks and the related security fixes release notes on the Apple support website. 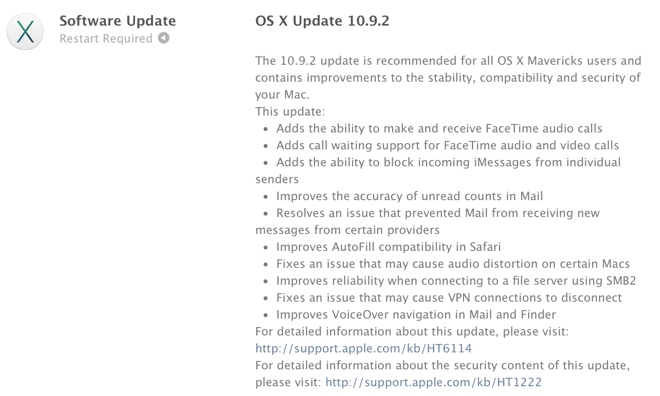 Mavericks 10.9.2 is a free update for anyone who is already running a previous edition of Mac OS X 10.9. The update can be installed from the Mac App Store > Updates tab. You will need to reboot your Mac as part of the upgrade process. I recommend that MacBook, MacBook Air, and MacBook Pro owners plug-in their notebooks before attempting the upgrade.